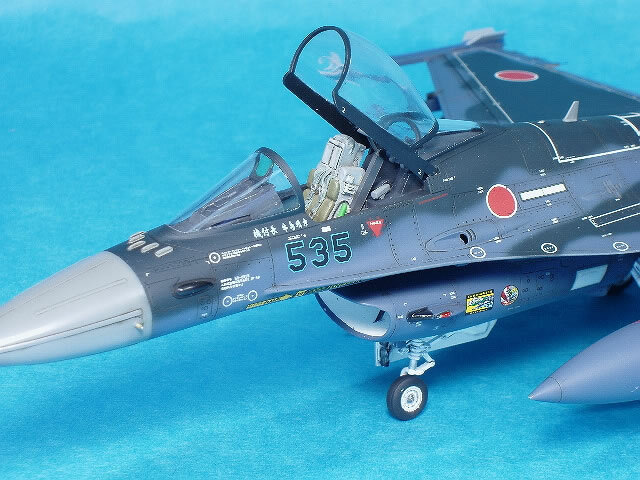 This is Hasegawa’s 1/48 scale JASDF F-2 with Afterburner decals. 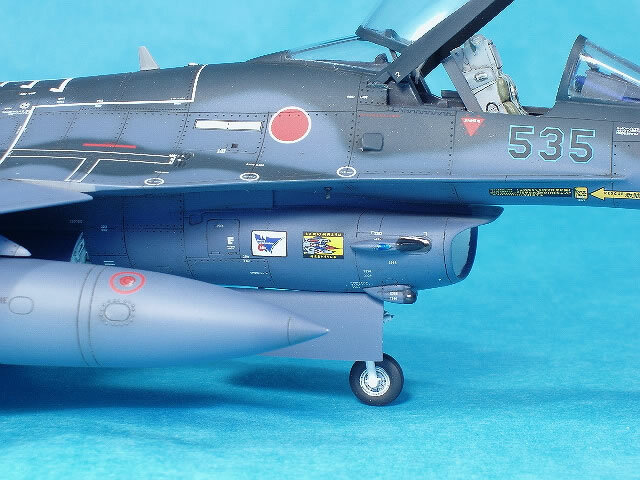 While it looks very much like a standard F-16, the F-2 has a different shaped wing with 25% larger area, larger horizontal stabs, and a slightly longer and wider fuselage, among other differences. 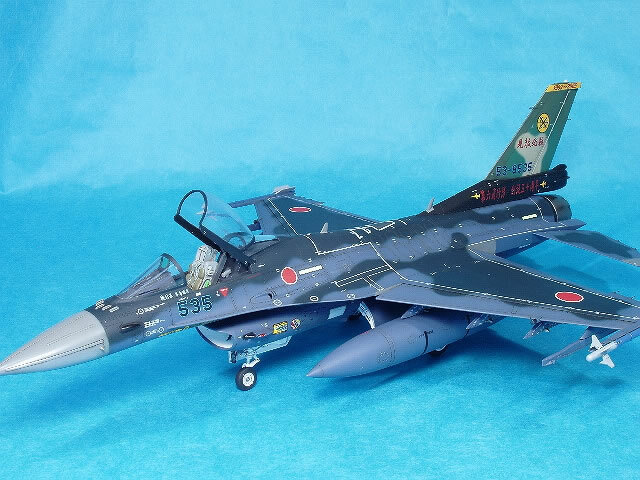 I love JASDF jets with their unusual camouflage colors and colorful markings so when I was given the opportunity to review one of Afterburner’s F-2A/B decal sheets, that moved this kit to the top of the “build-me” stack. 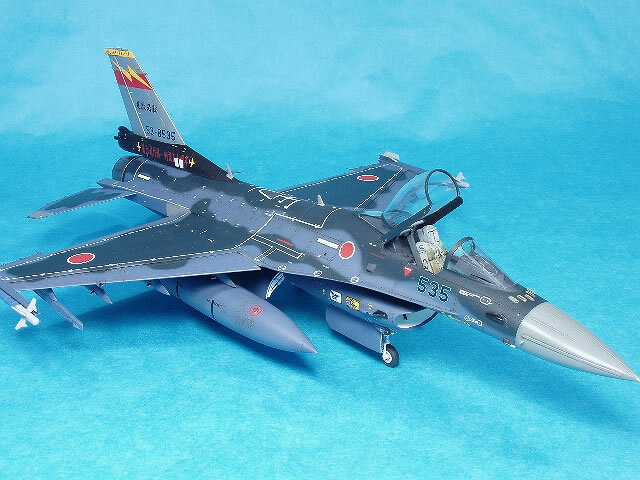 The kit is standard state-of-the-art Hasegawa; nicely done recessed surface detail, well detailed gear bays and landing gear, and a decent cockpit let down slightly by a seat that needs a lot of work to make it look busy enough. 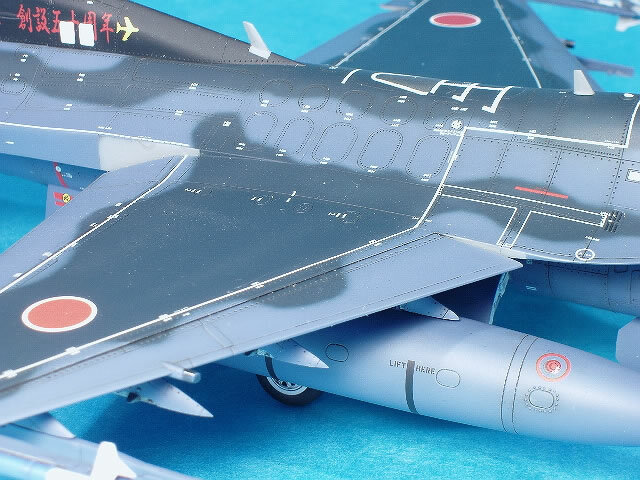 Things-under-wings include a full compliment of pylons, a centerline fuel tank, 2 wing tanks, 4 AIM-9s and their corresponding launcher rails; 2 for the wingtips and 2 for the outermost pylons. 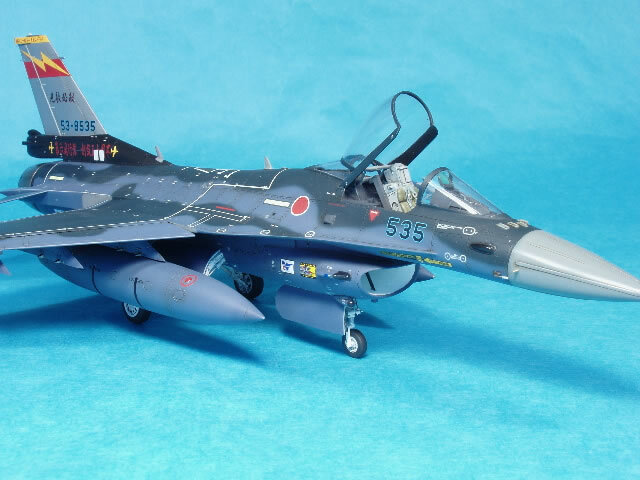 I don’t know how many parts, if any Hasegawa has carried over from their F-16 series but at the very least, the main airframe components, windscreen and canopy have to be new moldings. They’ve gone their F-16 series one better in the intake department by taking the intake trunking all the way back to an engine face over the main wheel well. More on how that went together later. 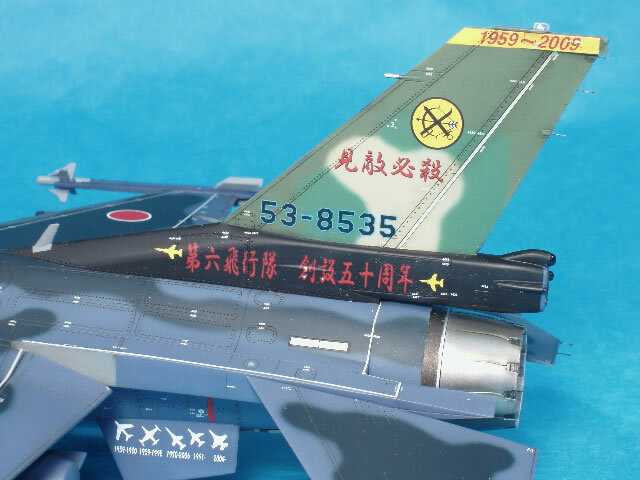 Kit decals are standard Hasegawa and all that that implies. I can’t/won’t/don’t speak to accuracy because I’m one of the “if it looks like” crowd. My pleasure in this hobby comes from building, not doing research. But as a kit assembler over 30 years experience I feel qualified in saying in terms of buildability, this kit has no unexpected vices or gotchas. Beware the intake though……unless you plan on admitting self emasculation by using an aftermarket FOD cover. The 4 piece intake trunking has 2 forward halves split horizontally and 2 rear halves split horizontally. Those seams are easy enough to clean up but the front and rear come together at an upwards angle which makes it nearly impossible to clean up the front-rear seam. Fortunately by block sanding the mating surfaces, I was able to get a good enough fit front to back that you can only see a bit of seam if you hold the model in a precise way, shine your flashlight at a particular angle, tilt your head at an inverse angle, close 1 eye and hold your breath all at the same time….and any contest judge who goes to those lengths deserves to see whatever it is he’s looking for. I considered other construction options for the trunking but the way I did it seemed to offer the best tradeoff. The only other construction problem I ran into was in cleaning up the nose cone seam. The nose cone is not a separate piece but is part of each fuselage half. Normally this isn’t a problem but the seam ran directly under the side nose cone strakes, which made cleaning up the seams AND preserving the strakes difficult. So I just went ahead and sanded off the strakes, cleaned up the seam, then replaced the strakes with strip plastic. The only modifications I made to the kit were to replace the kit seat with a Verlinden seat from an F-16 I built 15 years ago, add brakes lines, replace the plastic nose probe with a sewing needle, and replace all those horribly overscale and misshapen static discharge wicks with 4lb test fishing line. Initially, I expected finding the right colors to be a bit of an issue. Kit instructions recommend sea blue over intermediate blue. Everybody has those colors in their stash , so a no brainer, right? 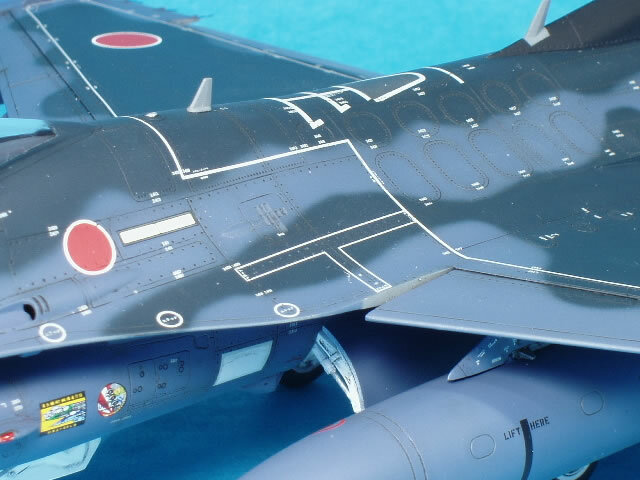 Well, several years ago, I built a 1/72nd scale F-2B and used Model Master sea blue over Model Master intermediate blue. While the GSB was perfect, the MM intermediate blue was way too light, way too gray and way too wrong, even to my normally uncritical eye. So a-huntin’ through the paint stash I went, and what to my wondering eyes did appear (I’m writing this on Christmas eve), but a 23 year old jar of Gunze H-56 Intermediate Blue, the exact number called out in the instructions. Looking at it, I was reminded why I hadn’t touched it in over 20 years; it was too dark and too blue for the US Navy WWII tri-color scheme but comparing it to pics of some F-2s, it was perfect. Hotdamn and hallelujah, whodda thunk it? So with paints selected, I put my Badger 150 to work on a freehand paint scheme. 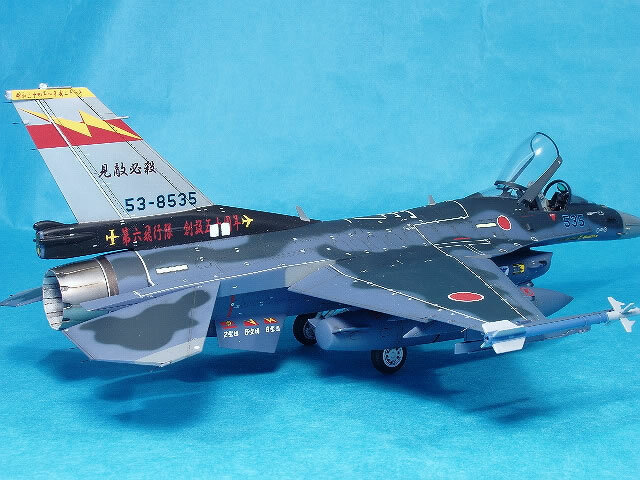 For decals I used Afterburner’s excellent sheet and chose the 6 Hikotai 50th Anniversary scheme. 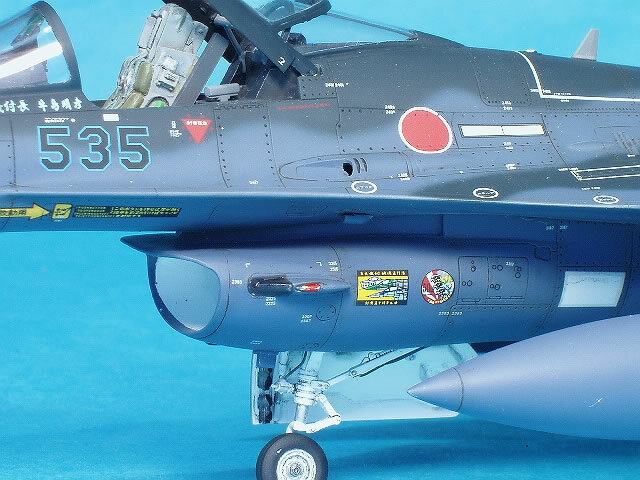 For a complete review on this sheet, my write up should be posted by now on the IPMS-USA website but for purposes of this let me say this gorgeous sheet replaces all Hasegawa kit decals…..and then some. I went all out with the stencils and spent in the neighborhood of 12 hours applying all those decals; 3 hours alone in getting the walkway stripes down, correctly aligned and straight . For the final stages, a warning about hanging stuff underneath the aircraft. 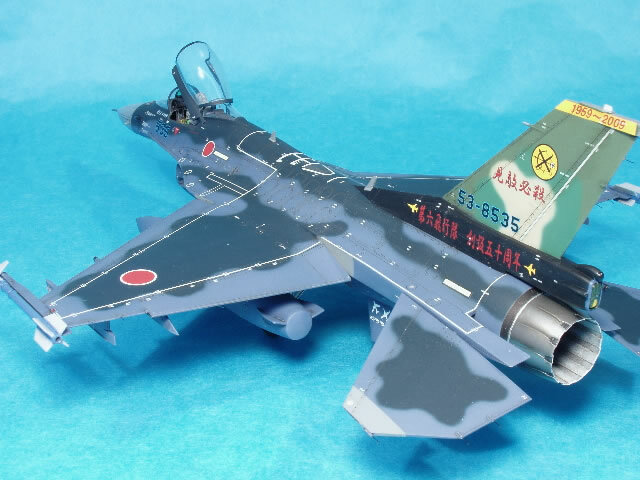 In doing my usual minimal amount of research, I looked at a bunch of F-2 pictures and didn’t see one carrying both a centerline fuel tank and wing tanks at the same time. That doesn’t mean they can’t or don’t, it just means I didn’t see any pictures of it. Your research may vary. 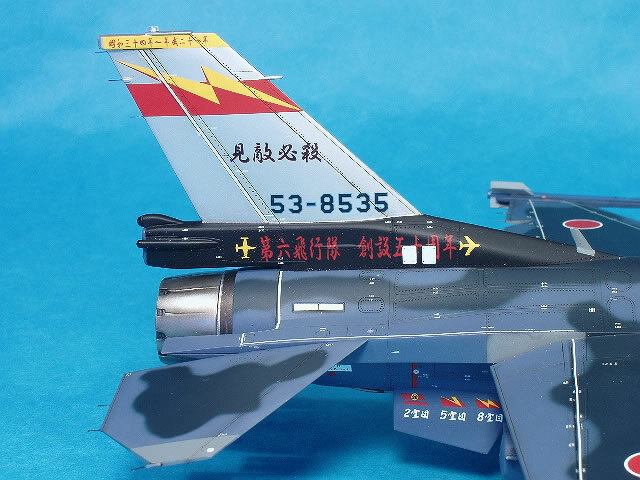 So, that’s it - a good kit helped out by an excellent decal package.